Contact See Tickets customer services by calling their UK phone number 0115 912 9000 for technical support with the online order tracker, to make a booking for an upcoming concert and for refunds. Contact See Tickets to manage your existing booking by calling their customer service phone number 0115 912 9000, for instance if you would like to claim a refund for a concert event you cannot attend you can call this helpline for resale information. Moreover if you are having difficulties using the online order tracker you can dial this number to confirm whether your tickets have been dispatched, if you used an incorrect delivery address then you should notify them as quickly as possible. You may also call this helpline to make a payment if you purchased your event ticket in installments. Calls to the See Tickets customer care helpline are charged at the same rate as phoning local UK numbers which start in 01 and 02 area codes. This also means you can contact them for free if you get the use of inclusive minutes on your tariff, however if you have run out of these you will have to pay a per-minute rate alongside an access charge. Lines are open during standard office hours of 9am-5pm Monday-Friday. Contact See Tickets to make a booking over the phone by calling their helpline number 0871 220 0260. Please ensure that you have all your payment details and number of tickets you require to hand for your group so that your booking can be processed as swiftly as possible. Disabled customers should call this helpline to request the appropriate seating and accessibility arrangements. You should note that their telephone bookings helpline is charged at 13p per minute as well as the access charges set by your provider. Therefore it is recommended that you use their online service instead to save money where possible. This helpline is available 24 hours a day, seven days a week however an automated service will be in effect outside of conventional opening hours. Make a See Tickets booking for the latest shows on London’s West End by calling their telephone contact number 0871 297 0777, where you can request details on upcoming musicals and dramatic theatre performances. Note that this is a business-rate hotline which is charged at 13p per minute plus your network’s access charges which are usually more expensive for mobile customers. Customers can use the online booking system provided by See Tickets to amend their existing reservation and send online messages to their advisory staff. Alternatively you can post public messages on their social media platforms or private postal enquiries to their office address. Visit the See Tickets customer service portal available on their website to send email enquiries about your booking. Here you will also find links to upcoming ticket releases, helpful frequently asked questions (FAQs) and live updates on ticket dispatches. 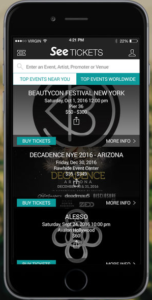 See Tickets are available on various social media websites where they advertise their latest ticket releases. Moreover customers can send messages to these profiles for enquiries, however please do not include sensitive payment details in public correspondence.